A+ Federal Credit Union is excited to partner with Akins High School for the 2018-2019 school year! Our goal is to provide opportunities for students to learn about smart money management through an on-campus branch, paid internships, in-class presentations, special products for students, and more. 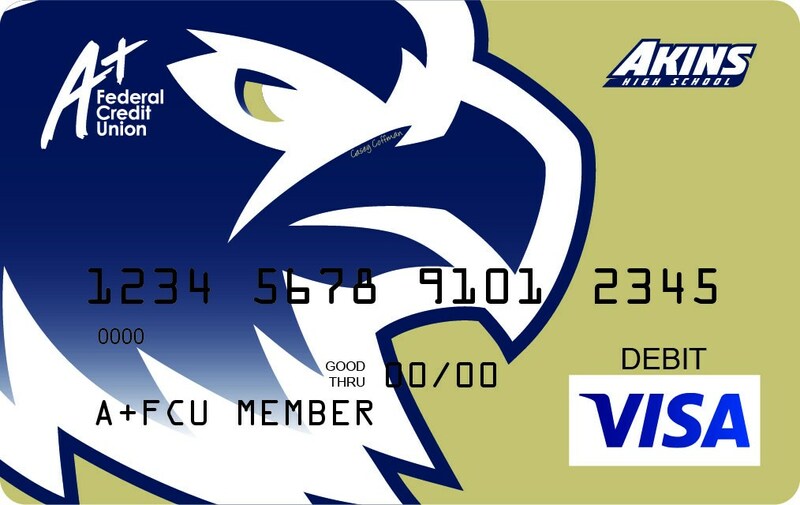 Open a Cash-Back Checking* account at the Akins High School branch and get your Eagles Debit Card. A+FCU will donate up to 10¢ to your school for each purchase made with the card and you'll earn monthly cash back too. *Membership required. All checking accounts screened through ChexSystems. eStatements and debit card required. Conditions and restrictions may apply. Subject to change without notice. The A+FCU Akins High School branch is staffed Akins HS Interns and A+FCU employees. Students have the opportunity to become interns and receive school credit, work flexible hours, and get paid. They’ll also receive teller training, learn about delivering a great member experience, participate in employee training programs, and more. This is hands-on program that provides exposure to a financial services career. To see what positions are available, visit aplusfcu.org/careers. We’re committed to helping our college-bound members with scholarships for educational expenses. Each year we award multiple scholarships to hardworking high school and college students. For 2018, we awarded 45 students with $2,000 scholarships for a total of $90,000. Visit aplusfcu.org/scholarships to sign up for notification about the 2019 A+FCU Scholarship Application. The Akins HS branch is located on the first floor by the library and main entrance. It has both an in-school and public entrance. The branch is open 11:30 am – 5 pm, Monday – Friday, and is closed on school holidays. Membership required. Federally insured by NCUA.